Jenny Lewis and Johnathan Rice have made a lot of music together in various settings and they’ve finally decided to release an intentional, collective project. Under the name Jenny and Johnny, these two multi-instrumentalist songwriters have created an eclectic batch of harmony-soaked indie rock duets for their first release, I’m Having Fun Now. All of their joint creative abilities are on full display as they wrote every song together, sing them all together and play pretty much every instrument you hear on the album. With all of the surf guitar tones, sugary vocals, upbeat rhythms and energetic basslines, you could assume that this album was recorded in their home base of sunny Los Angeles. In reality, they spent five weeks in Omaha during one of the worst winter snow storms the city had ever seen to complete these songs. How they were able to capture blue skies and sunshine in audio form is just one more example of the wide ranging talents of these two. 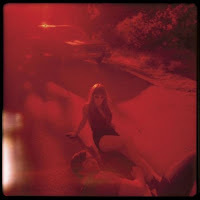 Jenny’s previous work in Rilo Kiley shows that she has no problem standing on her own while sharing vocal duties. But where Rilo Kiley songs can easily be broken up into “Jenny songs” and “Blake songs,” all of the Jenny and Johnny songs have a distinct duet vibe to them. When they’re singing together, there’s not a lead/background vocal split feeling. They know how to pull off a true duet, ones of the Johnny and June, George and Tammy, Sonny and Cher caliber. While tracks like “Switchblade,” “New Yorker Cartoon” and “Slavedriver” showcase their vocal hand holding for the entire song, every cut has at least one moment where their voices weave around each other and become one sound. The raw lyrical direction of the album contrasts nicely with all of the feel good musicalities as well. Relationships (“Scissor Runner” and “My Pet Snakes”), the recession and bank bailout (“Big Wave”), religion (“Animal”) and even politics (“Committed”) gets honest and gritty attention. With both of them having recorded solo albums before, it seems that they wanted to make sure there was no confusion regarding the status of this album. They’ve truly created something new and original as Jenny and Johnny and after listening through the album a few times, I’ve gotta admit, I’m having fun now too.